I just finished paring down a seed order for tomatoes (if I had the space, I’d get one of each! ), and I think I have finally made my choices. I’m ordering heirloom seeds and one or two hybrids. This order is only for the smaller, “novelty” tomato varieties. I’ll be ordering the seeds for larger tomatoes from another company. I think I have found a type of tomato I have been looking for, like the ones we grew in the big bow window in our living room several winters ago. These were incredible plants, just a few inches tall, but they produced an astonishing number of small tomatoes all winter long. They tasted so good. I never knew what variety these tomatoes were… my aunt had given me the seeds and she did not remember. I have been searching garden centers and seed catalogs ever since, looking for a similar tomato that I could grow inside… with no success… but this year seems to be the year for houseplant-size, high-yielding tomatoes. I have found them offered by several of the major seed companies. I’m ordering three varieties that I hope might be similar to the one I had… Red Robin (maturity 55 days) and Micro Tom Hybrid (maturity 88 days) that can both be grown as houseplants, and Tiny Tim (maturity 60 days) that is better suited to a larger container. 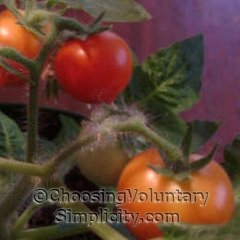 I’m also ordering seeds for both the yellow and red Tumbling Toms… an indeterminate branching tomato that cascades down twenty or more inches and is suitable for a hanging container. I have no idea where I will grow these two, because neither of our porches gets enough sun, but I know I can find a sunny spot for them. 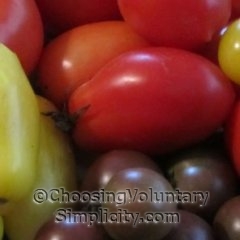 I’m ordering a Rainbow Cherry mix with ripe tomato colors ranging from green to purple to yellow to orange. Also some high-yielding tomatoes that can be grown outside in containers, like Martinos Roma, Oregon Spring, Glacier and Alaskan Fancy. And of course seeds for the Yellow Pear tomato… I always grow that one because I think it has the absolute best tomato taste. Does anyone else like these smaller tomatoes? What tomato varieties… large or small… will you be growing this year? Wow…small world. My husband and I just transplanted our little tomato plants outdoors (in pots). It is a good day here in South Florida to do it. This is our second year attempting this after growing cherry tomatoes last year. We planted regular beefsteak tomatoes this year. I will be glad when we gain more confidence! Our plants were doing well last year until we went on vacation and our neighbor forgot to water. It got to almost 100 degrees here, and they were absolutely fried, along with our cucumbers and jalepeno peppers. It was sad, but we are hopeful this year will be a good little crop. Good Luck with your garden! This is our first year as a married couple in a new house that actually has a big enough back yard so we have some pretty big plans for our garden this year. I want to experiment with several different kinds of tomatoes because I have no idea which ones will grow well in our climate or our type of soil. I like your idea of the container tomatoes and also about having some of the fun types of different colors. Gardening should be fun after all! Your blog is great, I get a lot of really good ideas reading your posts. I’m so excited about the idea of growing houseplant tomatoes. I found the seeds you mentioned and I am going to get some to try. I love tomatoes! We grew yellow and white tomatoes last year. We liked the yellow ones best but it was nice to have something unusual. I have been drooling over the seed catalogs. We only have a small garden space but we have a garden every year. Love the fresh veggies! Lisa, I envy you. We just had another blizzard last night and today there is lots of new snow on the ground. Transplanting tomatoes outdoors for us won’t happen until late May or early June. Hope you all have a great tomato year! Impressive! I’m not at the tomato-growing phase yet, but I certainly love the variety at the farmer’s market. Can’t wait (getting tired of potatoes and applies…)!! My husband loves loves loves Sun Gold tomatoes. They’re little yellow cherry tomatoes that taste like sugar because they are so sweet! Sun Sugar from Pinetree Seeds. Sweet and yellow like honey on the vine with a brix rating of ten. (as high as you can go) When I am outside I plop one in my mouth and I can taste sweet sunshine! The vines grow hundreds of them and I have many for my neighbors. I might try Mortgage Lifter this year for my main crop of tomatoes. It is an heirloom from the Great Depression years. Let us pray we get good weather for our gardens this year. Last year I had to pull all my tomatoes up due to the cold, wet spring and a terrible disease that attacked all our gardens in the mid-coast. Good luck to everyone with their gardens this year! Wow! I love the yellow pear tomatoes–they are the most wonderful tasting. We might have to try the houseplant tomato. I miss them in the winter!